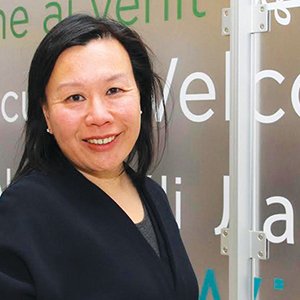 The desire to create meaningful change fuels Jadine Chou's efforts to ensure student and security at Chicago's public schools. Many people talk about making a difference, but Chicago Public Schools Chief Safety and Security Officer Jadine Chou (’86) is actually doing it. For more than six years, she and her team have dedicated themselves to ensuring the safety of more than 370,000 students on CPS campuses. The desire to improve the lives of others is a powerfully motivating force, Chou says. For her, the desire came after she earned an MBA and built a promising career in executive and management roles with Fortune 500 companies such as Kraft Foods, Motorola, and AT&T. Despite feeling comfortable in the corporate world, she sensed something was missing. While researching ways to help the disadvantaged, Chou saw a job opening for the Chicago Housing Authority and felt it was just the kind of work she wanted to do. She joined the CHA in 2007 as a properties portfolio executive and quickly worked her way up to senior vice president. While overseeing 17,000 public housing units, security was a large part of Chou’s job. She realized community involvement was key, so she engaged CHA residents in her initiatives with the Chicago Police Department, resulting in an overall 20 percent reduction in serious crimes across the properties. “It was one of the most important parts of my job. If families aren’t safe, what else matters?” she asks. Chou enjoyed her work with the CHA and had no intention to leave when CPS contacted her in 2011. Still, she found the prospect of helping even more people through the school system compelling and accepted the offer. Today, she approaches her job from an engineering perspective, as she has throughout her career. “Northwestern trained me to define the problem I’m trying to solve, rather than jumping to the solution,” she explains. Instead of focusing on punishment in instances of misbehavior, Chou’s team considers what may be causing the problem, or what factors in students’ lives contribute to their behavior. This active, supportive approach has shifted the perspective of safety in schools.